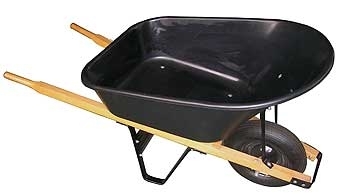 6 cu ft wheelbarrow features seamless steel tray, hardwood handles and pneumatic knobby-tread tire. 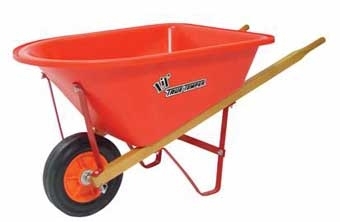 6 cu ft wheelbarrow features corrosion-proof poly tray, hardwood handles and pneumatic knobby-tread tire. 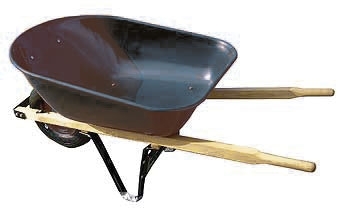 Kids poly wheelbarrow real wood handles soild tire. 0.9mm Black Steel Tray. Steel Handles. 400-8 PU wheel (non flat tire). True Temper 8 cu. ft. yellow poly contractor wheelbarrow. Heavy-duty, corrosion-proof poly tray with steel front tray braces, cross braces and shoes. H brace. Two 16 in. wheel assemblies with pneumatic 2-ply tires with ball bearings. 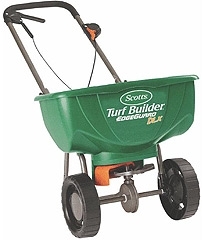 Dual wheels provide added control and stability when carrying heavy loads. 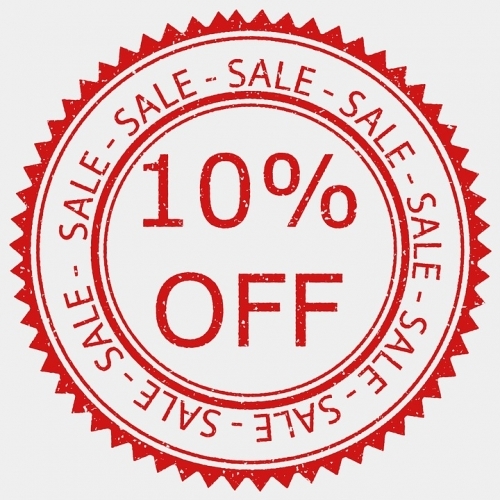 Provides an exclusive design which reduces wrist fatigue. This ergonomic design causes less wrist fatigue than other hand-held spreaders. It's great for applying lawn seed, fertilizer, and other products on small areas, or for spreading ice melting product in winter. 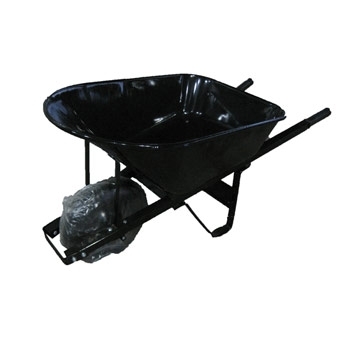 It provides a rustproof, plastic hopper and agitator. 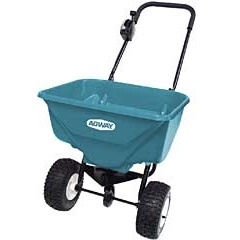 Economical, handheld rotary spreader that uniformly applies lawn fertilizer, grass seed or ice melt. Ideal for small applications. Heavy duty construction. Fully assembled and ready to use. 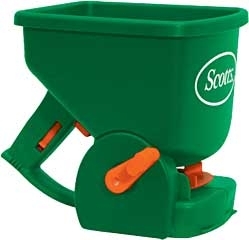 Spread any seed or granular material over hilly or wet terrain. Nylon bag with 20lb capacity. Gives a 8-15&#39; spread width. Rocking agitator gives consistent flow to the impellor. Great for grass seed, fertilizer, food plot seed mixes. Easy to use, folds up for easy transport and storage. The Ames poly easy roller cart is made with a tubular steel axle, extra wide wheel base and flat bottom. Recessed tool tray keeps tools organized. Tool clips on side can be used to hold a shovel, rake or hoe. Two 11 in. poly wheels. 200 lb. capacity. Limited manufacturer lifetime warranty. 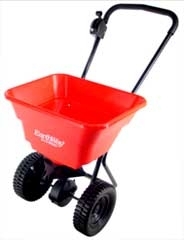 The ultimate grass seed spreader features a easy operation hand crank, waterproof nylon bag, sealed gearbox for trouble free service, intergrated stand for easy filling, oscillating shut-off / Provides smooth even flow and a wide shoulder strap for comfortable use. Less waste, less clean-up and better for your environment. Keeps fertilizer off landscaping, driveways, sidewalks, and out of waterways. Has Scotts Exclusive EdgeGuard Technology. 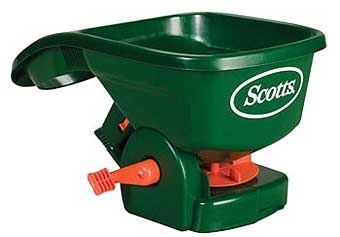 Designed to ensure superior results when used with Scotts fertilizer. 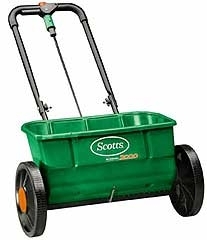 Holds up to 15,000 square feet of Scotts lawns products. The 2040PiPlus puts professional quality and features in a smaller partially assembled package. The 2040PiPlus out performs all other spreaders of its size and price with true Commercial features at an affordable cost. 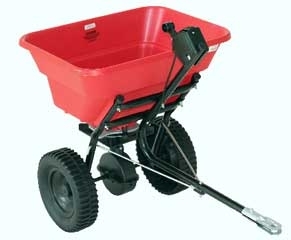 Designed with todays garden tractor owner in mind, it is the most economical tow spreader on the market today. 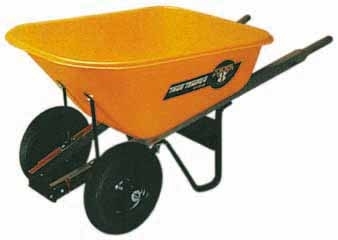 The Deluxe Broadcast spreader is perfectly sized for use on medium to large lawns. 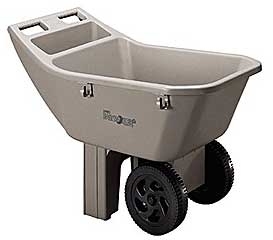 The rust proof 80lb capacity hopper and 10 inch deep lug wheels brings capacity and ease of use to the homeowner. Ev-N Spred rust proof 3 hole drop system for even spreading of any material. 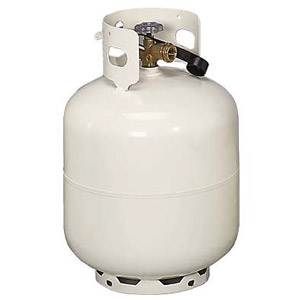 Fully assembled with folding handle. Easy to use gauge and lever control for precise applications. Rust proof hopper with a 65lb capacity. 9in pneumatic tires for easy rolling over your lawn, and high speed gearbox for wide even spread widths. 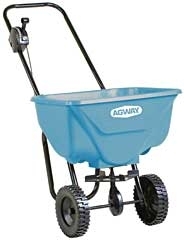 Agway label hopper. Ev-N Spred rust proof 3 hole drop system for even spreading of any material. 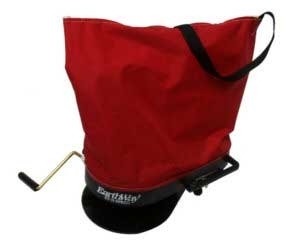 Fully assembled with folding handle. Easy to use gauge and lever control for precise applications. Rust proof hopper with a 65lb capacity. 8in poly wheels and high speed gearbox for wide even spread widths. 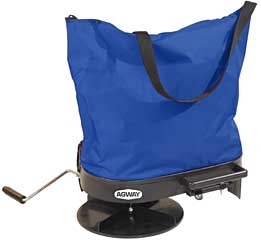 Agway label hopper.